When Jim Thiel of Thiel Audio passed away in 2009, his vacated engineering position wasn't filled until September 2013. Then Mark Mason became the company's new director of product development. Coming directly from SVS where he was responsible for their Ultra range, he'd previously worked a long stretch at PSB. The first indication of where Thiel in their new 'Mason era' is headed comes from the TM3 at your left. That's a $2'999/pr monitor ($599/pr stands) which flips the firm's trademark sloping baffle to the back. The front is vertical, the back angled. With a stacked Ply cabinet, construction has gone original Magico Mini. Drivers are a 1" metal-dome tweeter and 6.5" fiberglass woofer. Loading is vented. Basic specs are 45Hz-30kHz response, 87dB sensitivity and nominal 8-ohm impedance with a minimum 3.5 ohms. All this is from a formal press release. Not part of it but still floating on the web is the photo at your right called TT3. It's presumably a preview of where Thiel will take their next generation of floorstanders. Let's back up in time by a few years to when Italian Quadrivio equity firm created umbrella organization Fine Sounds SpA which over a relatively short time acquired Sonus faber, Audio Research, Sumiko, Wadia and McIntosh Labs. Many industry observers expressed fear that for these hallowed hifi houses the takeover would have disastrous Gordon Gecko-style consequences. Nothing like it transpired. Au contraire. Each brand in Fine Sounds' portfolio has prospered since and retained its discrete corporate identity. For Wadia and Sonus faber in particular updated form factors revived company images. Whilst new Sonus styling admittedly underwent a radical departure when ownership first changed, last year's Olympica range is arguably as true to their legacy Serblin-era styling as is conceivable when the founder never made any floorstanders. 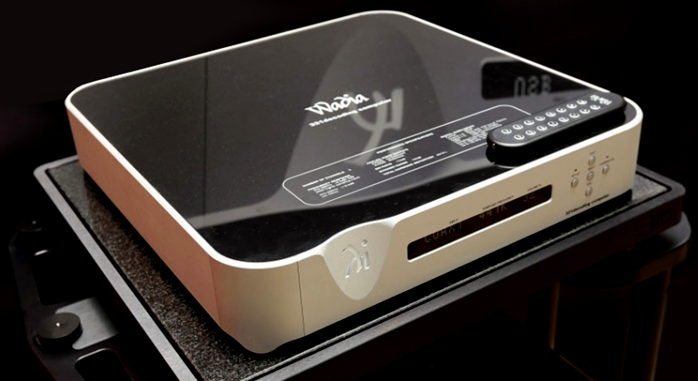 As current CES 2014 reports show, the latest Wadia 321 Decoding Computer continues the theme of respectful reinvention. It retains familiar design cues—the milled-out logo recess on the fascia most prominent, the prior corner stanchions barely hinted at—whilst modernizing overall appearance. With this degree of tactful makeover, one should be very curious what industrial designer Livio Cucuzza might come up with for ARC and McIntosh if he is allowed to. Which returns us to Thiel's new ownership and their considerable challenges. Jim Thiel was a staunch proponent of 1st-order phase and time-coherent loudspeakers with sloping baffles. It's what made the brand. Vertical baffles were acceptable only with dual-concentric two-way or in-ceiling speakers. The new TM3 look categorically nothing like prior Thiels. If the TT3 web shot proves factual, even the new floorstanders are set to mix up the original recipe. This illustrates the multi-layered challenges all iconic companies face when death of a founder, change of ownership, market conditions or all of these factors enforce radical change. What exactly makes a Thiel a Thiel to become not merely another entry in the endless glut of speaker options? Would Thiel have been better off hiring an engineer committed to upholding Jim Thiel's design ethos? Time will tell. Even where first transitions are rockier, change of ownership or engineering vision needn't be a bad thing. This has been amply proven by Fine Sounds' stewartship of its brands. Likewise for the new owners at Nagra Audio which is now formally known as Audio Technology Switzerland. Granted, Swiss business culture is more conservative than most. How far 'off the leash' future industrial Nagra design will be allowed to run remains to be seen. The new HD DAC certainly looks as classically Nagra as ever. Keeping our eyes on Thiel promises more radical cosmetic changes. The need to reinvent oneself also hits the press. Despite portentous launch announcement, TAS founder Harry Pearson's website HP Soundings.com floundered less than a year later. The High-Fidelity.com blog focused on links to reviews published elsewhere. Original content limited itself to commenting on these reviews plus providing standard industry news. Now both sites have joined. High Fidelity Report is staffed by Harry Pearson and collaborator Joey Weiss plus Michael Mercer and Chris Sommovigo. It used to be seriously frowned upon to derive income from the hifi biz and moonlight as a reviewer. You couldn't for example be a paid consultant to NordOst and publish a magazine without getting fired. Presently these Chinese walls are being questioned. Chris Sommovigo is both audio importer and cable manufacturer. He just published an intro for his first THFR review. Meanwhile aged industry legend Pearson writes 5-paragraph reviews like this which Joey Weiss completes with 'additional comments'. About possible implications, one regular on AudioAsylum's infamous Critics Corner board opined that "this website is obviously a vanity blog. 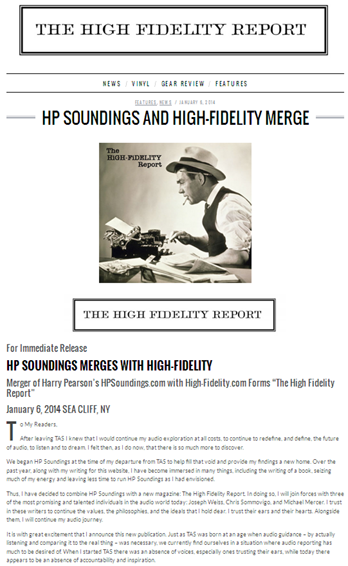 HP Soundings did not make a thin dime in profit and it never will. Neither will this venture. So you can almost say there will be no chance of impropriety because it is just a bunch of grizzled veterans teaming up to blog, killing time." Without the gift of foresight, who knows? It does raise interesting questions though. Is content irrelevant or useless if its creators don't write for profit? Should dealers, manufacturers, importers and consultants publish formal reviews? What makes a formal review? What distinguishes 'magazines' from 'blogs' from 'forums'? Are a writer's objectivity and independence more affected if he has something to lose (credibility and its direct impact on livelihood) or works as freely volunteering enthusiast? Does being grizzled render one less relevant? Isn't it often the actual industry insiders with decades of experience who have the best grasp on goings-on? How much does any of it ultimately matter when manufacturers are free to choose whom they wish to support with review loaners; when readers are free to read and believe whomever they please; when most on-line content is free to begin with? Which publishing conventions and standards should remain in place as unassailable and essential? Which would benefit from being redefined or relaxed? This brief editorial today wasn't about proposing answers. It was nothing but a pointer to consider these and related matters for yourself. Change is definitely always afoot. What we think about it and how we react is up to us. 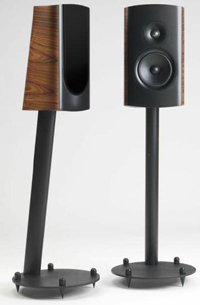 PS: As John Atkinson confirmed in Stereophile's CES 2014 show report here about the floorstanding Thiel prototype shown above, "... the new TT3 speaker is intended to replace the CS3.7 as the company’s flagship when it comes to market in the late summer. Bill feels that with Mark now leading the engineering, Thiel can be taken to a larger customer base." On departing from Jim Thiel's 1st-order design focus, John wrote that "Mark [Mason - Ed] explained that without taking away from what Jim had achieved, he believed that while it is possible to achieve a flat time-coincident on-axis response from a multiway design with first-order filters, this can involve compromises in the three-dimensional radiation pattern if the drive-units are not coincident. And as Floyd Toole has demonstrated, the time coherence of the first-arrival sound does not compensate, subjectively, for the problematic off-axis behavior. Although Mark believes Toole is correct, he performed extensive listening tests with prototypes of the TM3 before settling on the high-order crossover that was ultimately used."